Brooke's collection of unreleased Woody Guthrie lyrics set to her own original music isn't Mermaid Avenue III. But it never had to be. Much of the press surrounding Jonatha Brooke’s The Works trumpets the fact that the veteran folkie is the first woman to peruse the vaults of unreleased Woody Guthrie lyrics and build songs around them. But that milestone, like a vice presidential candidacy, isn’t worth squat if the musician or politician in question isn’t qualified, viable, or in good faith. Happily, Brooke is all of those things, and has been for quite some time. Whether as part of the long-defunct and much missed duo The Story or on her solid solo repertoire, Brooke has injected her smart, soulful folk songs with tinges of jazz and R&B, poetry-inspired lyrics, and piercing, inflection-filled vocals. It’s not like she just popped out of the musical ether armed only with the novelty that her name isn’t Billy or Jeff; what matters more is that she’s got the credentials to take on Guthrie and make him her own. And speaking of Bragg and Tweedy, it’s easy but a mistake to approach The Works with the Mermaid Avenue volumes in mind. Brooke’s album is not Volume III. As with the rest of her catalog, The Works falls on the more polished end of the folk and Americana spectrum. There’s no banjo-fueled “Christ for President” or spooked out and resonated “Black Wind Blowing”. Instead, there’s “All You Gotta Do Is Touch Me”, a warm and sensual duet with Keb' Mo', and the sugary, nostalgic “Sweetest Angel”. But that Brooke is drawn to more sentimental material isn’t a surprise or a detriment. The Works largely highlights the sweet and directly romantic side of Guthrie and fits them into structures more suitable to the coffeehouse than the Mountain Stage. The sun-dappled piano of “My Flowers Grow Green” pairs with standup bass, church organ, and sparse drums to provide a simple backdrop for Brooke’s voice to soar. It’s not just a pretty song or performance, it’s smart writing. Placing Guthrie’s litany of flowers, “My pinks and my phlox and my four o’clocks”, in a gospel setting is trickier than a standard I-IV-V hoedown. Deft use of minor chords, particularly on lines like “You’ll never kiss another / Prettier than me”, add extra layers of pathos and emotion that would be lost in a more basic folk pattern. “You’d Ought To Be Satisfied Now” appropriately swaggers as a brisk and intricate blues, and “King of My Love” squeezes especially wordy passages into an refreshing and original arrangement of Cajun accordion and piano that speeds and slows. 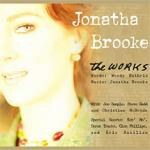 Each song on The Works takes a different stylistic approach, from the anthemic “There’s More True Lovers Than One” to the smoky, noir-jazz of the opening “My Sweet and Bitter Bowl”, but the production unites them all with sharply recorded performances and a focus on Brooke’s articulate voice. The cohesive sound also helps the two wholly Brooke compositions not stick out like sore, anachronistic thumbs. “Little Bird” is gentle, organ-driven soul, while “Taste of Danger” swims into slightly rockier territory. It’s perhaps inevitable that until more and more artists become involved in bringing unheard Guthrie lyrics to light, albums like The Works will be compared to the first adventures. But the same expectations should not be applied. Brooke’s song selection and inventive and playful imagination have taken Guthrie's words and given them, if not radical, then at least somewhat unexpected places to live on, places that speak as much to her gifts as his. “My Battle” fuses gospel organ and pacing with the country associations of pedal steel guitar, embodying the populism of “This Land Is Your Land” with those two instruments, and closing with the refrain, “Teach me how to fight, how to win, how to love.” Glory be that through his archives and help from folks like Jonatha Brooke and more to come, he continues to teach us.